The Handel and Haydn Society plays Haydn. Makes sense, right? No surprise to hear four works by the esteemed composer and one half of this institution’s namesake on its “Haydn in Paris” program. Given the reputations of this period instrument orchestra and of its conductor Harry Christophers, it’s not even a surprise to hear those works performed magnificently. That’s just what this ensemble does, right? 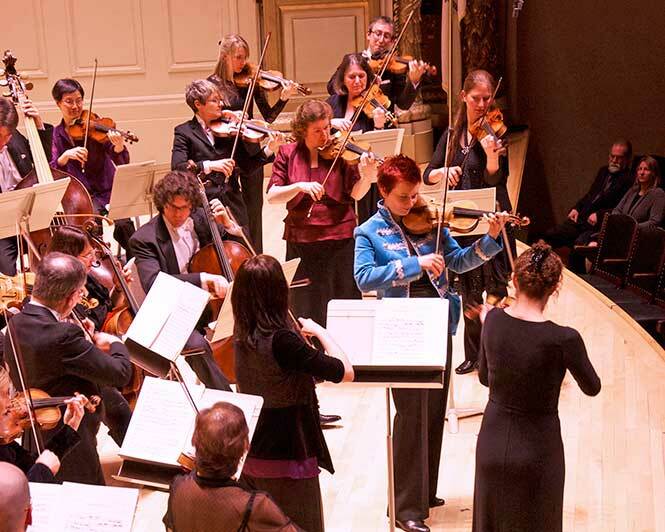 Yet on Friday night the Handel and Haydn Society still managed to open ears and raise eyebrows beyond the expected calls of “well-played!” and “just beautiful…” from a grateful audience at Symphony Hall. It started with the sheer sound of this orchestra. Its strings can be warm and coaxing, for example in the slow introduction to the Symphony No. 6 in D Major, Le Matin (Morning), rich yet playful as in the second movement Adagio or aggressively bright for the martial first movement of the Symphony No. 82 in C Major, The Bear. Winds and brass seized upon Haydn’s ingenuity as well as love of orchestral color. More than sounding desolate, the overture to L’Isola Disabitata (The Deserted Island) turned downright haunting. Le Matin featured several short but charming solos for flutist Christopher Krueger and bassoonist Andrew Schwartz, as well as dialog between concertmaster Aisslinn Nosky and cellist Guy Fishman. Some listeners may have preferred more definition from the (notoriously temperamental) horns but this ensemble’s organic cohesion and utter snap was compelling throughout. Harry Christophers’ direction is obviously a huge part of that sound. His tempos allowed an intriguing balance: he eased back slightly in the first movement of the Le Matin while the following Adagio kept up a good clip, like a relaxed morning that gradually builds into bigger and better things. Christophers also avoided the racehorse fast movements of some period instrument groups or the lush, dragging slow movements of some large symphony orchestras. The minuets of both Le Matin and The Bear were stately and melodic, followed by climactic final movements. The conductor also consistently demonstrated a knack for knowing when to craft a phrase or push a rhythm, and when to leave things up to the empathy and inertia of the orchestra: he milked a few phrase endings in The Bear’s Vivace Assai, stepped things up incrementally towards the end of the skipping Allegretto and exploded the false endings of the droning final movement, whipping the musicians into a frenzy that belied any notion of period instruments being too soft or delicate. Perhaps the biggest surprise of the evening came with Christophers leaving the stage for Nosky to lead the ensemble and perform as soloist in Haydn’s Violin Concerto in G Major. Haydn wrote this piece early on his career as a showcase for the brilliant violinist Luigi Tomassini at Esterhazy. Its displays, dialogs between soloist and orchestra and chipper air can recall the light, bright but often one-dimensional works of the transitional Galant period. Just not in Nosky’s hands. Playing crisply without turning dainty, the violinist also dug into phrases over sustained chords in the first movement, leaned into high notes to add a smirk to the refined atmosphere and rode a gentle, laid back rhythm for the final movement. Her direction and solos were a welcome departure from the singsong feel and dustings in powdered sugar work that this lesser known work seems to invite. Tight yet spontaneous-sounding cadenzas just added to the sense of mature humor. The audience clapped between movements at several points, mercifully breaking concert etiquette and revealing just how much Handel and Haydn can still surprise its listeners, no matter how much they’ve spoiled us. I echo every word of this review. I have never heard H&H play better, and to the vigorous, clear, and beautifully articulated play was added some real (and worthwhile) originality of interpretation. During the opening symphony I found myself thinking, “this is like chamber music played by an orchestra of thirty instruments.” It seemed like I could hear every one of them, and every one of them was worth hearing. Nossky’s cadenzas in the concerto provided flourish and excitement while remaining appropriately scaled. Above all, this confirmed my belief in Christophers’ skills as an orchestral conductor. When he first came on board I was a little concerned that his background as a choral director might imply that the H&H were leaning towards de-emphasizing the Period Instrument Orchestra aspect of their identity in favor of their traditional focus on choral works, but this has nor proven to be the case. In particular I was impressed by his handling of the last movement of The Bear. I admit this has always struck me as a bit of a novelty act, with its bagpipe drone, its infectious (and repetitious) piping peasant air, and its Haydn-the-jokester false endings; what I hadn’t realized was that under all this playful cover Haydn is putting on a contrapuntal display. Christophers figured out how to keep the momentum from halting when the music did, so the excitement continued to build through to the finish. For a few seconds near the end I found myself reminded of the finale of the Jupiter symphony, and I had certainly never heard that before. By the way, I think the embarrassment felt by some at audience clapping between movements can easily be eliminated by designating such behavior as Historically Informed Concert Etiquette. Then all will approve. To complement all that’s been described, there was an additional visual pleasure in the blue livery-inspired coat that Aisslinn Nosky wore for her concerto: As fit the playing, the sight was unusual, beautiful, not too flashy. Yes, that was a nice touch. She then changed to black for the second half, which I liked to think reflected Haydn’s musical move from Esterhazy to Paris. Another detail that I liked was that one of the two basses appeared to actually be a bass viol (it had frets, and five strings), which added a growly, nasal timbre to the deep resonance of the bass; it expanded the expressiveness of some passages in le Matin, and gave an extra cut to the drone in the finale of l’Ours. I had not noticed this before; is this usual H&H practice, or an innovation for this performance ? It wasn’t mentioned in the program. @SamW – The bass viol is a copy of a 1754 Stadlmann that was used in Haydn’s orchestra. The copy was made by Oscar Kappelmeyer in Passau, Gesny who was tasked with restoring the original 6 years ago. Rob Nairn, H&H’s principal bass, plays this when appropriate. He can be heard playing in on Per questa bella mano on our Mozart Requiem CD recording. The instrument has 5 strings (usually basses have 4) and frets (also unusual).